All 2019 Lesson Programming Registrations are now open. Please send requests for lessons, with your availability, age and/or skill level to info@theparisclub.ca to ensure we can accommodate you. We’re happy to announce that we will be working with the terrific local Arnold Anderson Sports Fund to provide financial Assistance to families to support their athletic pursuits. Please see below for more info about the program. Kids Tennis introduces the sport of tennis in a fun and interactive way and ensures immediate success for young players aged 6-13. Using modified tennis balls, racquets, nets and courts, young players are properly equipped to enjoy rallies and learn the fundamentals of the game early on. Skills are developed much quicker, allowing for an easy transition to full court. Our club is fostering the growth of tennis for all ages with Junior Programming throughout the week and week end. This year we will be encouraging competitors of all ages to get on the court and play. Check out our social media and website for scheduling and program details. Our club competition levels are increasing amongst our young-adult (14-18) membership base. If you have interest in joining a competitive Team Tennis weekly play or enjoy competitive Tennis Ladder Matches, then send us an email to info@theparisclub.ca and we can help set you up with some match partners and ladder matches and sign you up for a season of exciting tournament play. Instructional tennis for beginner to intermediate players using modified balls and courts. Focusing on improving skills, starting points with serve, maintaining rallies, and basic understanding of tennis etiquette and match play. Program Participants in the ORANGE and GREEN levels are encouraged to join our drop-in match play and practice sessions weekdays 3:30-5:30pm, which will run concurrently with the lesson programs and will provide MATCH PLAY experience for program participants. This will ensure a familiar Practice/Play weekly schedule for your athletes. All programs will be filled with First-Come-First-Served order for participants. Online registrations will receive priority over in-person registrations. Program levels will be capped to ensure maximum effective training repetitions for all participants. A waitlist will be employed to offer available spots to interested parties. Please direct all programming inquiries to us at info@theparisclub.ca. Please contact Coach Tom to register your interest and availability for weekday and weekend scheduled play & practice drop-in sessions. If you would like to volunteer to help execute programming for the weekend junior sessions, please send us an email with your availability to info@theparisclub.ca. When you book a private tennis lesson with a pro, don’t be afraid to tell your coach what you want to achieve. If you’re a beginner, a qualified coach will teach you how to rally first so you learn proper footwork and positioning. Learning how to rally first lets you practice with a friend in between your lessons and burn some extra calories. As you get better, the coach will then make technique changes to your strokes to help you learn how to place the ball, add spins and develop power. Check out Dufferin Club summer camps in July and August with head coach Dora Stefanovic! 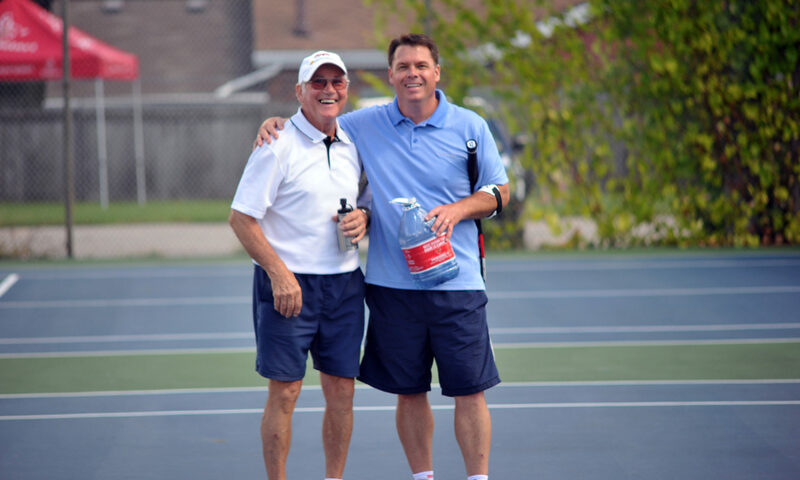 Visit our partners County of Brant Recreation Programs page and GSM Tennis Club in Cambridge. Eligible Brantford and County of Brant families can apply once a year to receive financial sports grants of up to $350 (per child) to use toward registration fees for the sport of their choice. Parents are encouraged to discuss what sports are of interest with their child and then fill out our quick and easy online application form or download and print off a form from our website to mail into or drop off at our office. Once a complete application is received, the Application Committee will then review the grant. The sport organization is then contacted to verify that the child is registered in the program before the payment is sent directly to them. This process can take between 2-3 weeks so parents are urged to submit grant requests with all the required information and proper documentation a month before the start date of the sport. The Arnold Anderson Sport Fund would not be able to provide this service if it were not for the generous support we receive from our caring and genuine community members and partner organizations. For private lessons, please contact Teodora directly at dora.tennis.canada@gmail.com or 519-802-7271.